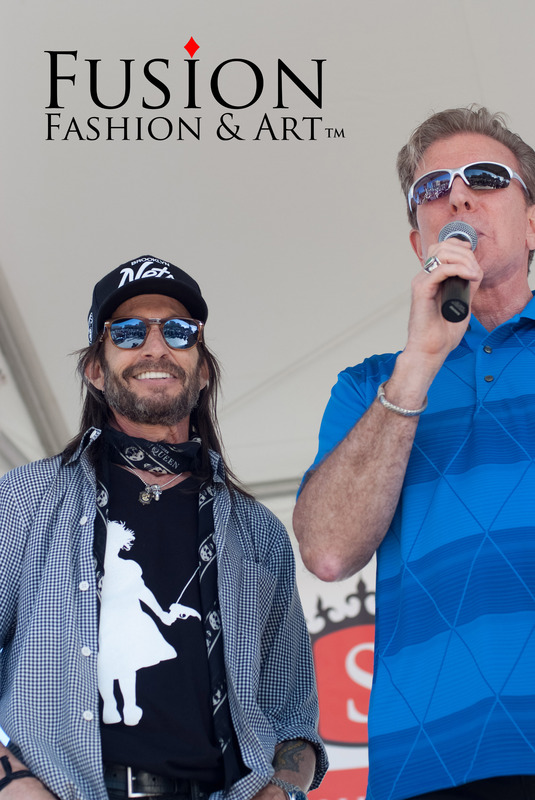 The Fast and The Fashionable also know as Fast The Fashion was produced at SuperCar Week downtown West Palm Beach on the waterfront featuring couture fashion designers Rosaura Pipenburg and everyday luxury fashion designer Rosetta Marett. Rosaura Pipenburg has worked with brands such as Carolina Herera, La Perla, Cache, Harmond and Blaine, and BCBG will be featuring couture gowns as well as her all new race inspired pieces. Hair and makeup was done by Dominique DiBenedetto and her crew of hairdressers and makeup artists Dphna More and Tracy Kinison. The created look focused on setting the trend for 2014 with a smoky orchid eye and the perfect hair that balances between functional and fashionable. With seamlessly slicked back hair the common ponytail was fluffed into cascading elegance. The resulting look was glamorous, functional and fun; perfect for day or evening. 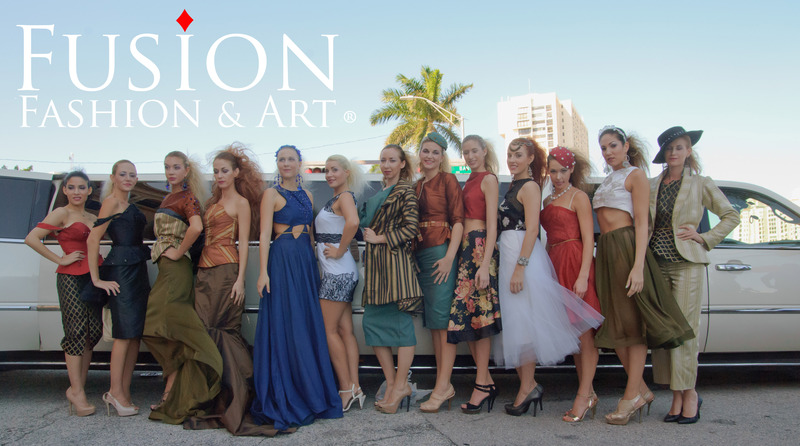 15 of Fusion Fashion & Art’s top models were escorted to the SuperCar Week show area via Mega LimoZ limousine service out of West Palm Beach. Flawless transportation included a stunning white Cadillac Escalade Super Stretch Limousine and a 55 foot luxury party bus for convenience and comfort at the stage area. Upon arrival at Flagler and Banyan Street traffic and crowds stopped to witness the glamorous spectacle. Dressed in the luxurious style of Rosetta Marett the Top Models graciously exited the limo for photos to be taken by the photographers and crowd. SuperCar Week’s Vice President Gina Palmer created her own unique brand of race inspired music for the show as well as provided authentic race flags from Palm Beach International Raceway to accompany the race inspired pieces created by Rosaura Pipenburg to celebrate SuperCars 4th year of record breaking growth. Under the direction of Gina and Lilyana Eisele C.O.O. of Fusion Fashion & Art the fashion luxury couture fashion show was a fun addition to the luxury SuperCars on display. crowd abreast of show activities, credits and highlights. One of those highlights was hairstylist David Kinigson of David K Space and SuperCar Week official hairstylist. David has had his work on the covers of GQ, Vanity Fair, Glamour and Vouge. 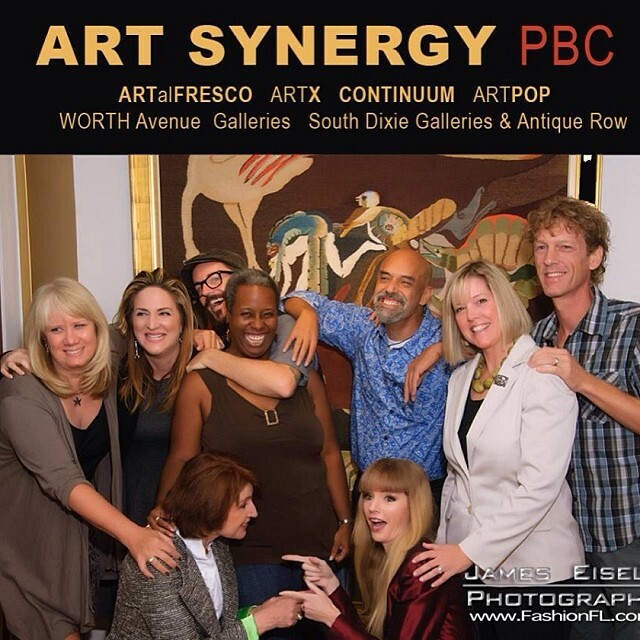 Future show productions for Fusion Fashion and Art are 3 satellite exhibits and shows for ArtPalmBeach spanning Palm Beach County in the Palm Beach art districts collaborative known as Art Synergy. Starting Wednesday the 22nd at 6pm Fusion Fashion & Art is producing an exhibit fashion and trunk show at the Black Tie & Sneaker VIP night at The Continuum Art District at the 312 Clematis Art Space of downtown West Palm Beach with art curators Craig McInnis & A.T.B Fine Artists & Designers LLC for the charity Faith’s Place Center for Education, Inc.
Friday the 24th starting at 6pm Fusion Fashion & Art is joining ARTal’FRESCO at the Boynton Beach Art District on West Industrial Avenue. ARTal’FRESCO is the kick off satellite exhibit for ArtPalmBeach 2014 and is headed up by artist and curator Rolando Chang Barrero. Saturday the 25th starting at 8pm Fusion Fashion & Art is producing 3 fashion art shows at the second satellite exhibit for ArtPalmBeach 2014 at the Northwood Art District in West Palm Beach. Show times are on the fashionable hour starting at 8pm until 10pm with 3 runway shows total. Featured designers are Rosaura Pipenburg and Northwood fashion designer Buera Parnell as well as a vintage fashion show by Northwood shops D’s Boutique and Lola’s Magical Closet. Several Northwood ArtX art walks will be available featuring the local art galleries between and after show times with limousine transportation available from Mega Z Limos. Featured Art Director is David Kinigson of the Northwood David K Space with rising star makeup artist Dominique Dibenedietto.